Preheat oven to 400°F. Coat 2 baking sheets with cooking spray. Coat an 8-by-11 1/2-inch baking dish with cooking spray. To prepare eggplant: Cut eggplants crosswise into 1/4-inch-thick slices. Whisk egg whites with water in a shallow dish until frothy. Combine breadcrumbs, 1/4 cup Parmesan, salt and pepper in another shallow dish. Dip the eggplant slices into the egg whites, then coat with the breadcrumb mixture. (Discard any leftover egg white and breadcrumbs.) Arrange the eggplant slices in a single layer on the prepared baking sheets. Bake the eggplant slices for 15 minutes, turn them over and bake until crisp and golden, about 15 minutes more. To assemble casserole: Stir basil into tomato sauce. Spread about 1/2 cup of the sauce in the prepared baking dish. Arrange half the eggplant slices over the sauce, overlapping slightly. Spoon 1 cup of the remaining sauce over the eggplant and sprinkle with half the mozzarella. Layer on the remaining eggplant and top with the remaining sauce, mozzarella and Parmesan. Bake the casserole, at 400°F uncovered, until the sauce bubbles and the top is golden, 15 to 25 minutes. 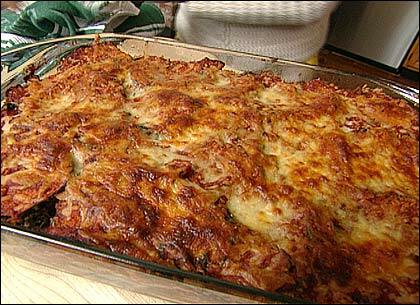 Chef Patsy Jamieson notes: EatingWell's makeover of a traditional eggplant Parmesan recipe trimmed 50 grams of fat from each serving! The key to lightening this classic is to make a meatless version — the meaty quality of eggplant provides enough richness and body — and bake, rather than fry, the eggplant slices. To make ahead: Prepare through Step 4. Cover and refrigerate for up to 2 days. © 2005 Eating Well Inc. This simple but intensely flavored sauce can be used in many Italian recipes. Make a large batch and freeze in small containers for quick reheating. Heat oil in a large heavy pan or Dutch oven over medium-low heat. Add onion and cook, stirring often, until softened, about 5 minutes. Add garlic and crushed red pepper; cook for 30 to 60 seconds. Add tomatoes, tomato paste and oregano; mash with a potato masher. Bring to a boil. Simmer, uncovered, over low heat, stirring frequently, until the tomatoes cook down to a thick mass, 45 to 55 minutes. Season with pepper. This segment appears in show #3004.